ATTITUDES AND PERCEPTIONS OF THE PUBLIC TOWARDS HOMOSEXUALITY A report prepared for the Office of the Commissioner for Administration (Ombudsman) By the. 6 6 The majority of the respondents believe that the sexual relationships between people of the same gender are wrong (always wrong 54% and most of the times wrong 26%). Furthermore, one out of ten respondents mentioned that the sexual relationships among people of the same gender are sometimes wrong. Only 6% believe that these relationships are not wrong (rarely wrong 3% and not at all wrong 3%). Out of those respondents who believe that the sexual relationships among people of the same gender are always wrong (54%, n=270), more negative towards this belief appear to be male, respondents who belong in the age group of 45-59 and above 60 years old, respondents who have primary school education, respondents who live in rural areas and have children, and among those who belong in social class C2. 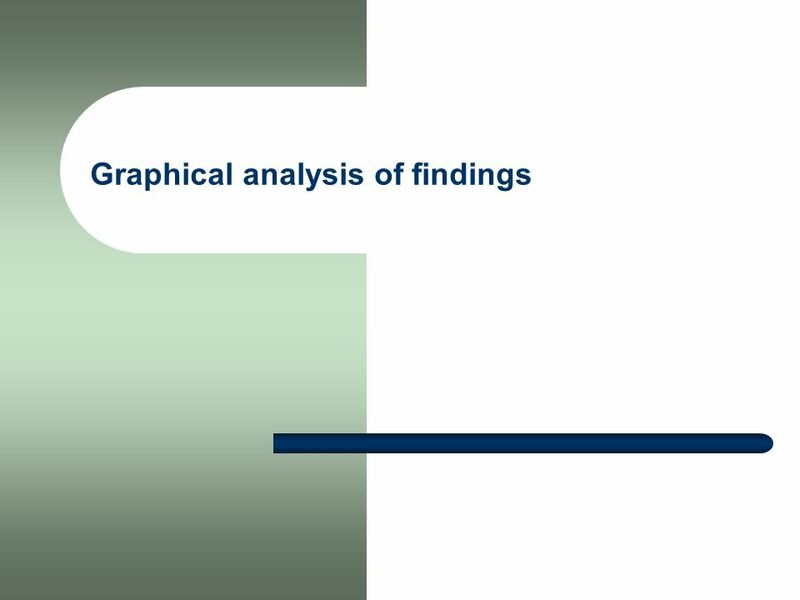 8 8 The above graph shows the biannual comparison, from 2001 up to now in accordance with the Cypriot Social Attitudes Series done by the Research Center of Cyprus College. For comparative reasons, the same question was presented in this survey as well. The survey results indicate that for the past two years the public condemns more the sexual relationships among people of the same gender. This might be due to the decriminalization of homosexuality. It seems that it has influenced adversely the moral attitudes of the public on this matter. Furthermore, due to the fact that homosexual relationships nowadays are more liberal and visible, people accept them less. 10 10 Almost six out of ten respondents (57%) believe that a homosexual person is born or becomes one (influenced by the environment). This belief is perceived more by people who are more educated, among higher social classes and among divorced people. 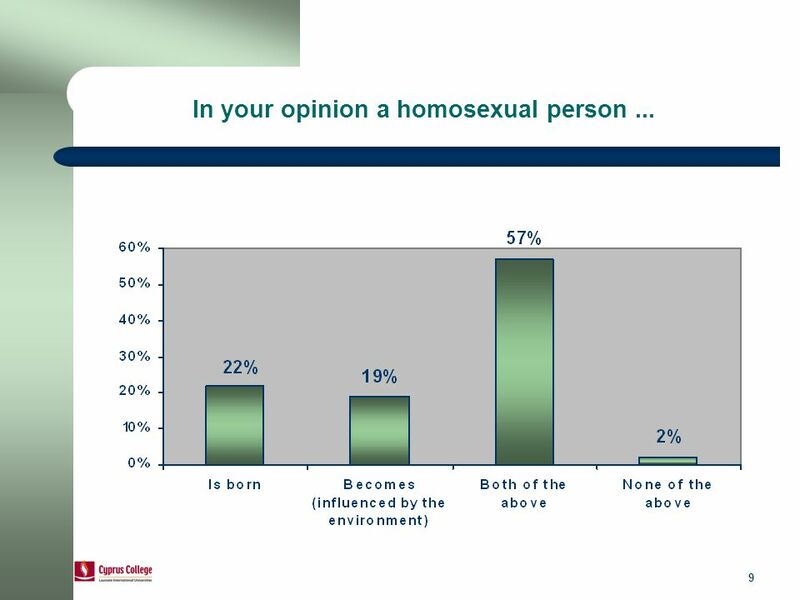 On the other hand, the difference between those who believe that someone is born as a homosexual (22%) or becomes one (19%) is minimal. 11 11 Generally, how comfortable do you feel being around with homosexual people? 12 12 The beliefs on how comfortable may people feel when they are around homosexual people are almost divided into two notions. 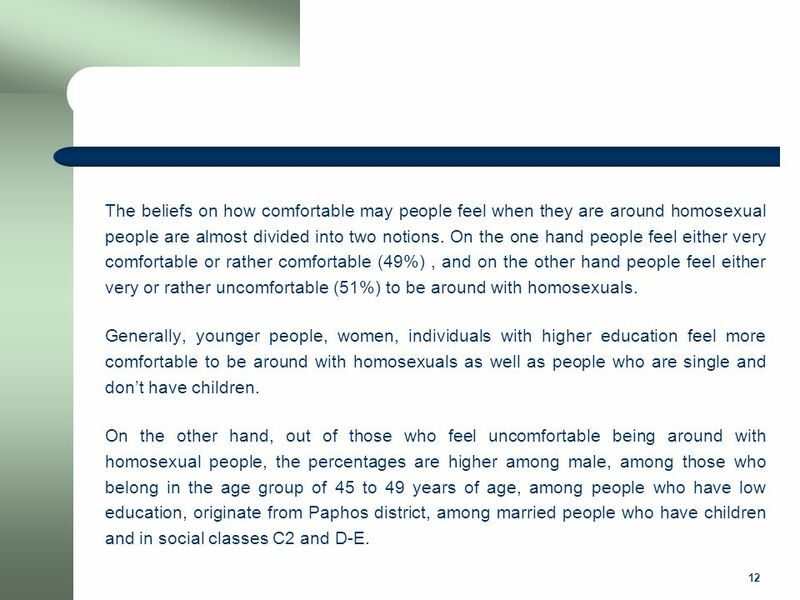 On the one hand people feel either very comfortable or rather comfortable (49%), and on the other hand people feel either very or rather uncomfortable (51%) to be around with homosexuals. Generally, younger people, women, individuals with higher education feel more comfortable to be around with homosexuals as well as people who are single and don’t have children. 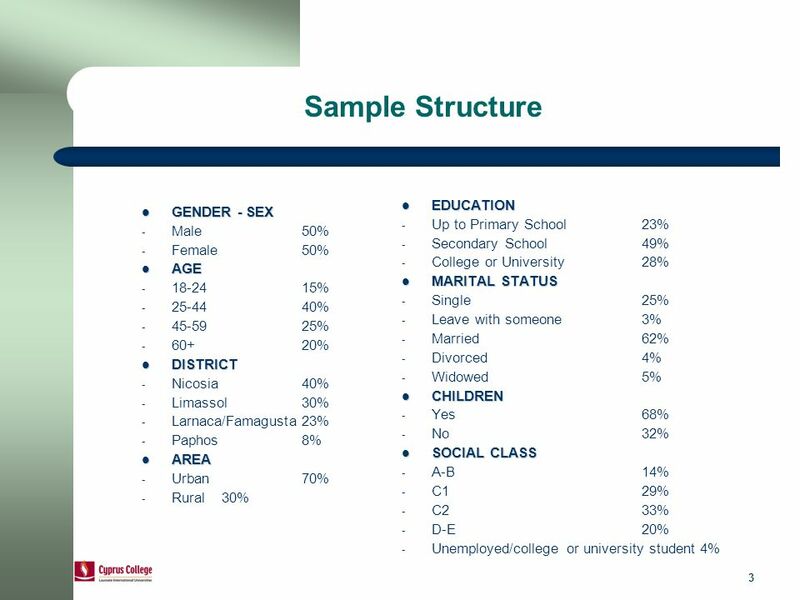 On the other hand, out of those who feel uncomfortable being around with homosexual people, the percentages are higher among male, among those who belong in the age group of 45 to 49 years of age, among people who have low education, originate from Paphos district, among married people who have children and in social classes C2 and D-E.
13 13 How did your attitudes change towards homosexual people during recent years? 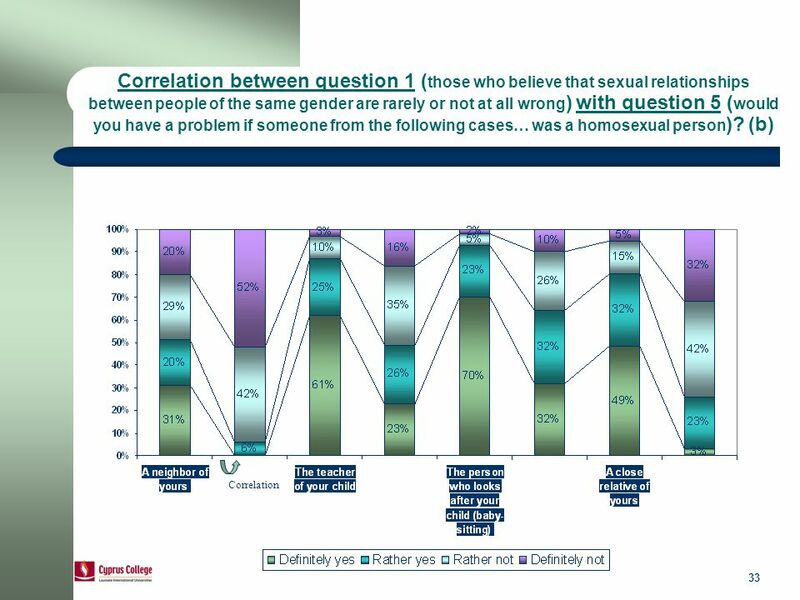 14 14 Six out of ten respondents stated that their attitudes towards homosexuals have not changed over the past few years. 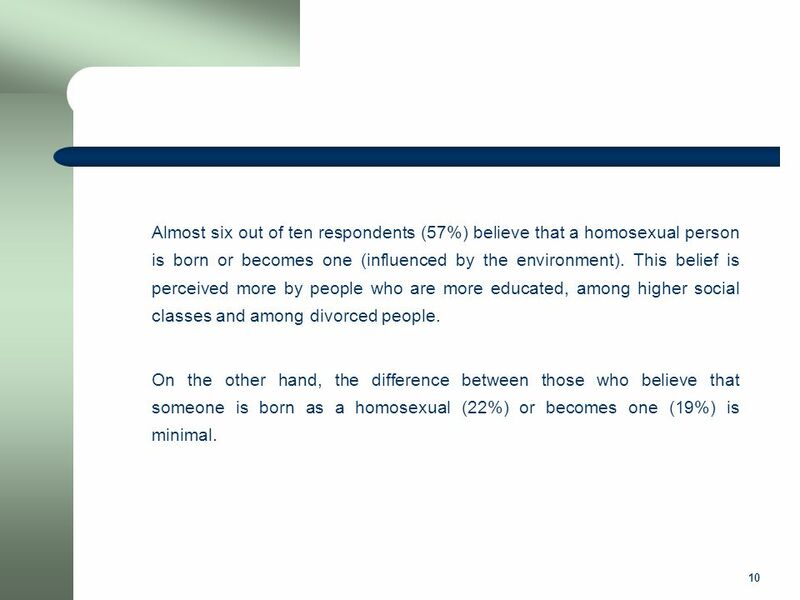 A further 27% indicated that they accept them more while 15% stated that they accept homosexuals less. 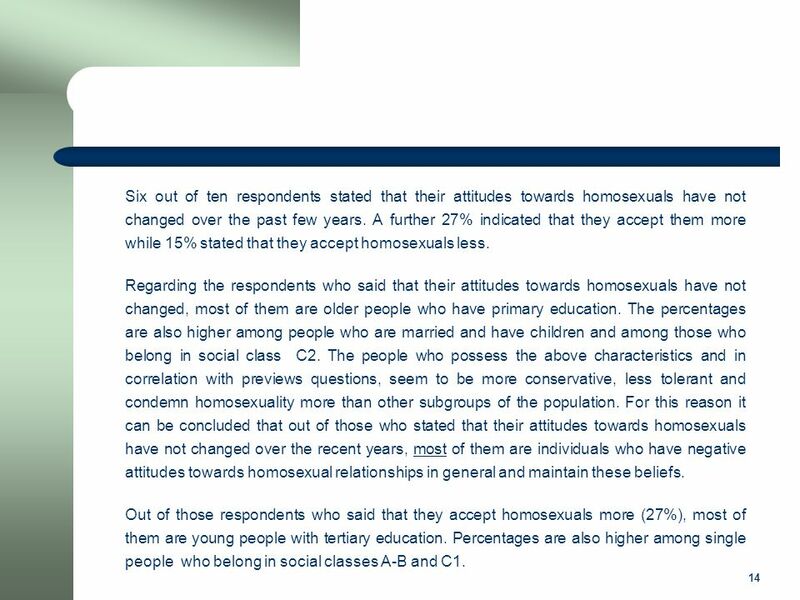 Regarding the respondents who said that their attitudes towards homosexuals have not changed, most of them are older people who have primary education. The percentages are also higher among people who are married and have children and among those who belong in social class C2. The people who possess the above characteristics and in correlation with previews questions, seem to be more conservative, less tolerant and condemn homosexuality more than other subgroups of the population. For this reason it can be concluded that out of those who stated that their attitudes towards homosexuals have not changed over the recent years, most of them are individuals who have negative attitudes towards homosexual relationships in general and maintain these beliefs. Out of those respondents who said that they accept homosexuals more (27%), most of them are young people with tertiary education. Percentages are also higher among single people who belong in social classes A-B and C1. 17 17 The results presented in the above charts are very interesting since they depict the degree of discomfort or acceptance of people towards homosexuals in specific roles in society, as well as at an interpersonal level. 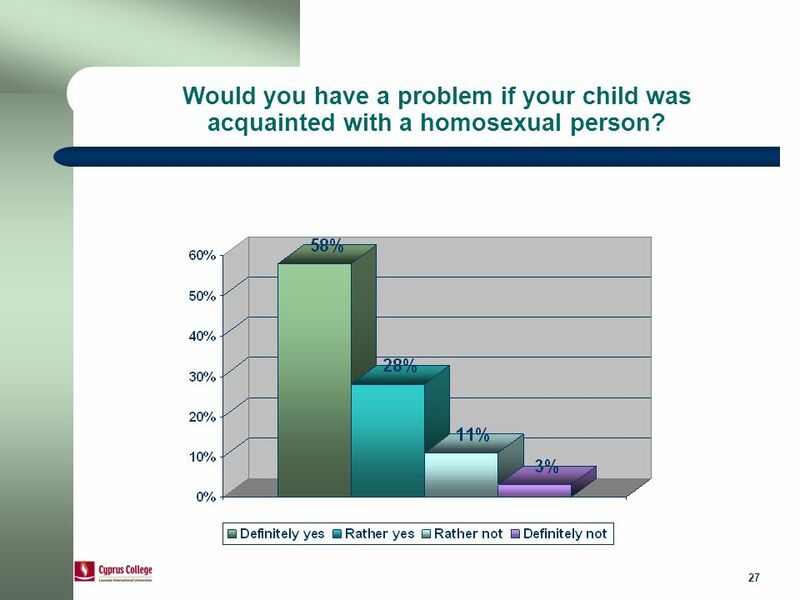 The majority of the respondents replied that they would have a problem if the person who takes after their child was a homosexual (definitely yes 70% and rather yes 23%), if the teacher of their child was a homosexual (definitely yes 61%, rather yes 25%) and if a homosexual was a close relative of theirs (definitely yes 49%, rather yes 32%). 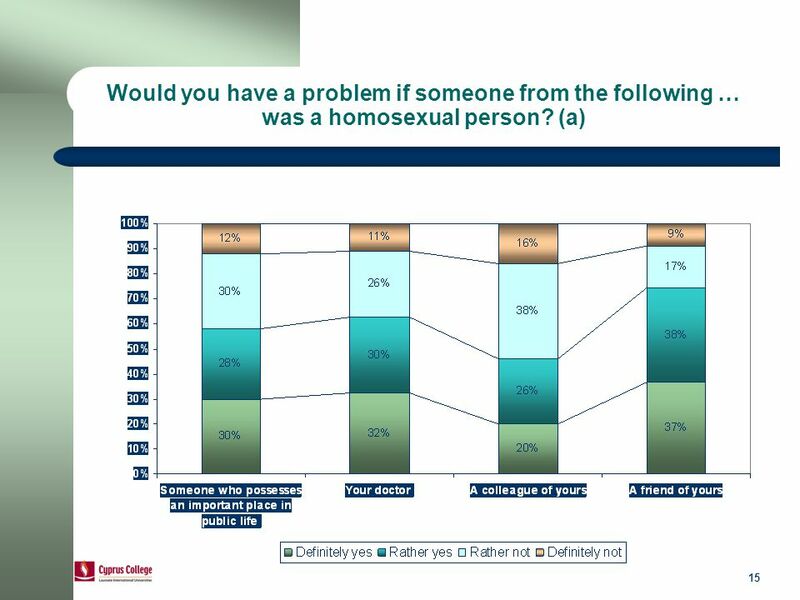 To a smaller extend, respondents replied that they would have a problem if a friend was a homosexual person (definitely yes 37%, rather yes 38%) and if that person was their doctor (definitely yes 32%, rather yes 30%). 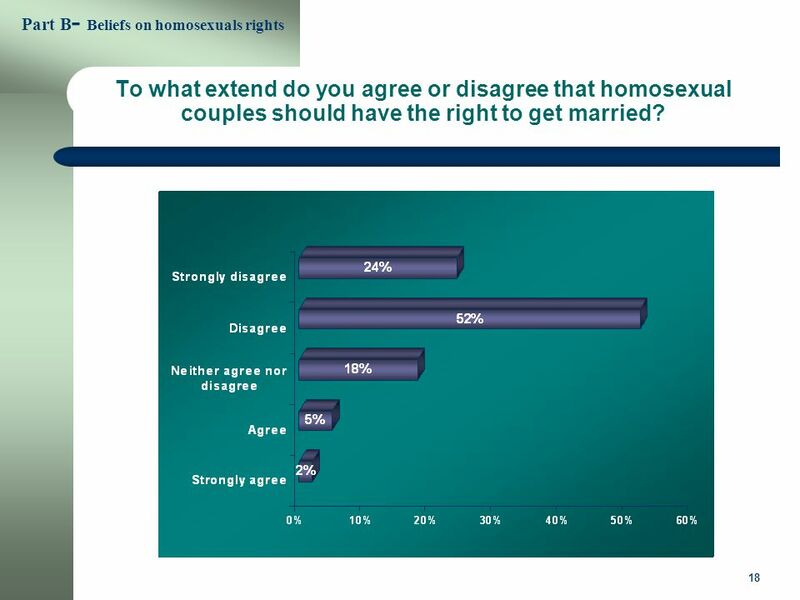 On the other hand respondents were not so negative if an important role in public life was possessed by a homosexual. 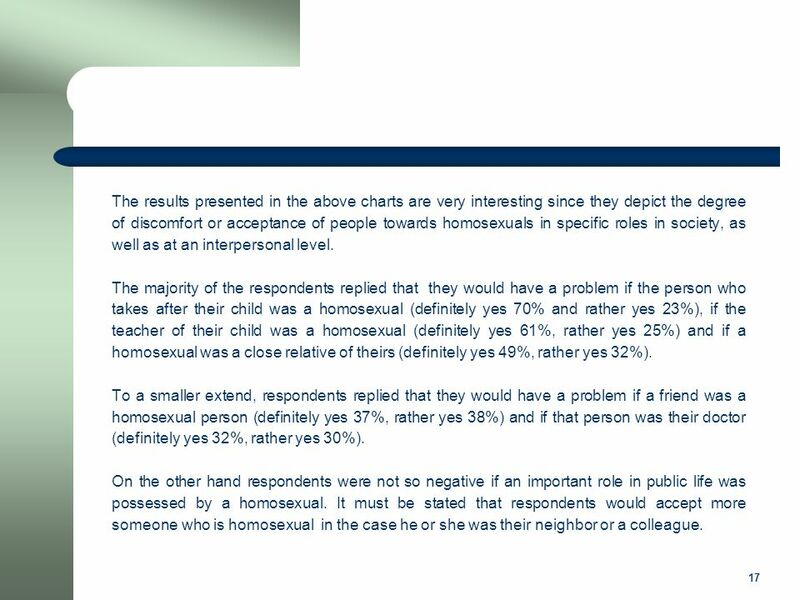 It must be stated that respondents would accept more someone who is homosexual in the case he or she was their neighbor or a colleague. 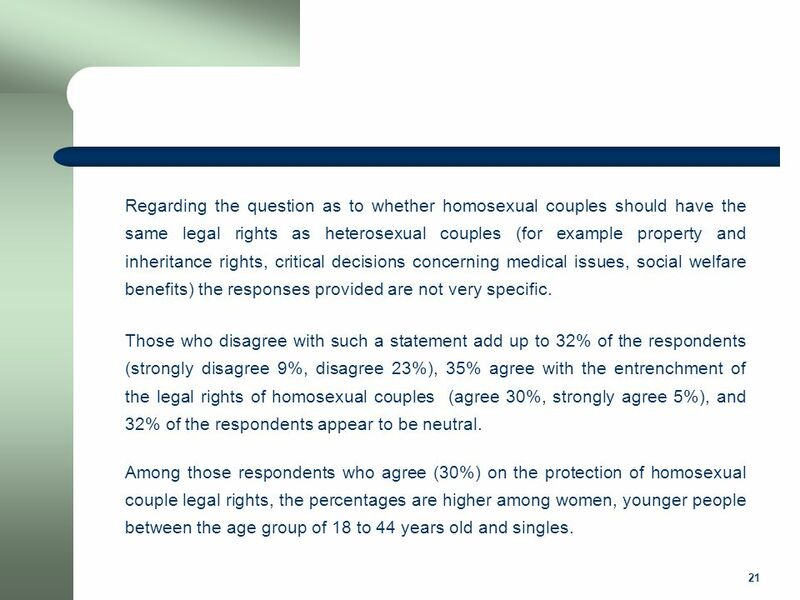 19 19 The majority of the respondents disagree that homosexual couples in Cyprus should have the right to get married (strongly disagree 24%, disagree 52%). This belief is adopted in a similar fashion by all age groups and districts in Cyprus. Only a minority agrees that homosexual couples should have the right to get married (agree 5% and strongly agree 2%) while 18% neither agree nor disagree. The belief that homosexual couples shouldn’t have the right to get married is adopted more by people who have primary and secondary education, by people who are married and have children, and in social classes C2 and D-E.
20 20 To what extend do you agree or disagree that homosexual couples should have the same legal rights as heterosexual couples? 21 21 Regarding the question as to whether homosexual couples should have the same legal rights as heterosexual couples (for example property and inheritance rights, critical decisions concerning medical issues, social welfare benefits) the responses provided are not very specific. 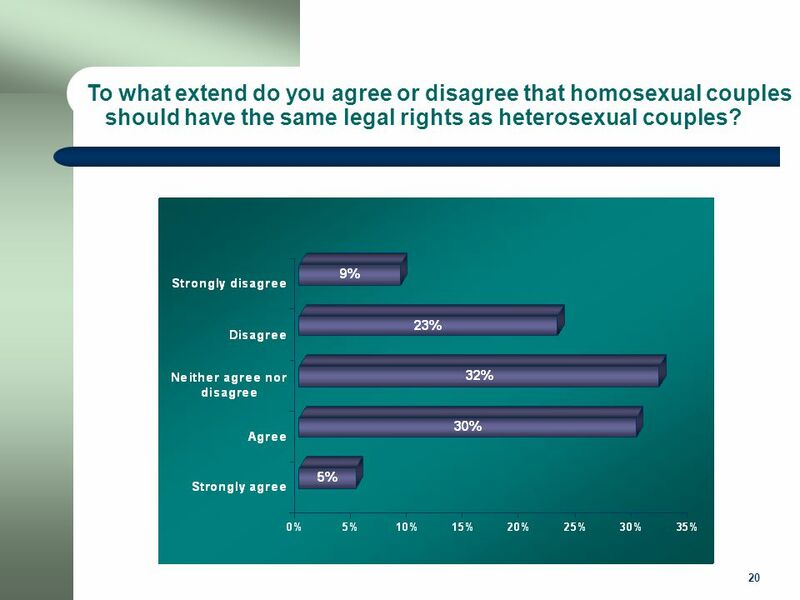 Those who disagree with such a statement add up to 32% of the respondents (strongly disagree 9%, disagree 23%), 35% agree with the entrenchment of the legal rights of homosexual couples (agree 30%, strongly agree 5%), and 32% of the respondents appear to be neutral. Among those respondents who agree (30%) on the protection of homosexual couple legal rights, the percentages are higher among women, younger people between the age group of 18 to 44 years old and singles. 22 22 What is your opinion on homosexual couples raising children? Eight out of ten Greek Cypriots are negative towards homosexual couples raising up children. This belief is the same in all the subgroups of the population, except younger people who are in the age group of 18-24 years old and among people who are single. 23 23 To what extend do you agree or disagree that homosexual couples should be legally able to adopt children? 24 24 Almost eight out of ten respondents disagree that homosexual couples should have the legal right to adopt children (disagree 53%, strongly disagree 24%). It is evident that the beliefs of the public are very negative towards homosexual couples adopting or raising up children. The refusal rates regarding homosexual couples raising up children (see chart page 22) are almost the same as the refusal rate towards homosexual couples having the legal right to adopt children. 26 26 The majority of the respondents 73% replied that they don’t know someone who is a homosexual person while 27% replied that they do know. 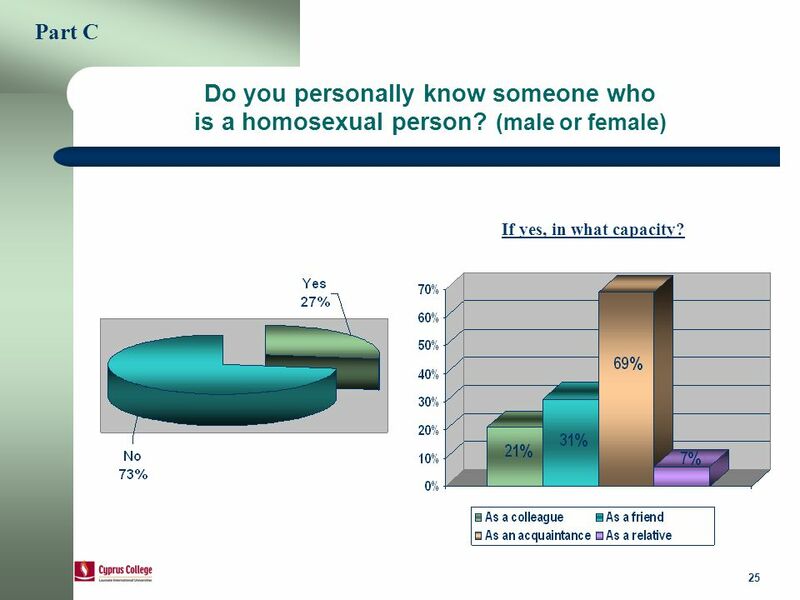 The respondents who said that they know a homosexual person (27%), they were asked to mention their relationship with that person. 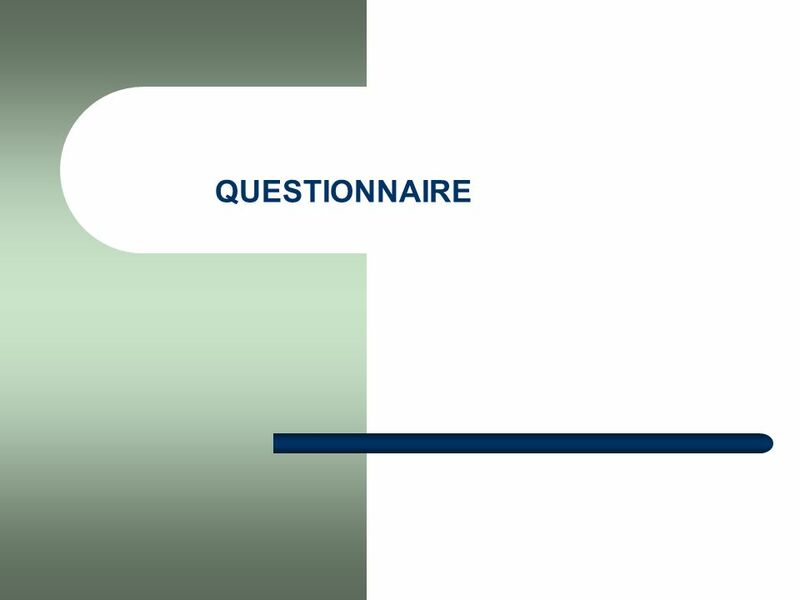 In this way seven out of ten respondents replied that this person is an acquaintance, 31% stated that he or she is a friend, 21% a colleague and 7% a relative. 27 27 Would you have a problem if your child was acquainted with a homosexual person? 28 28 Almost nine out of ten respondents (86%) stated that they would have a problem if their child was acquainted with a homosexual person (definitely yes 58%, rather yes 28%), while only 14% stated that they wouldn’t have such a problem (rather not 11%, definitely not 3%). Those who state that they would definitely have a problem if their child was acquainted with a homosexual person are almost six out of ten (58%) respondents. Their presence is more intense among older people. 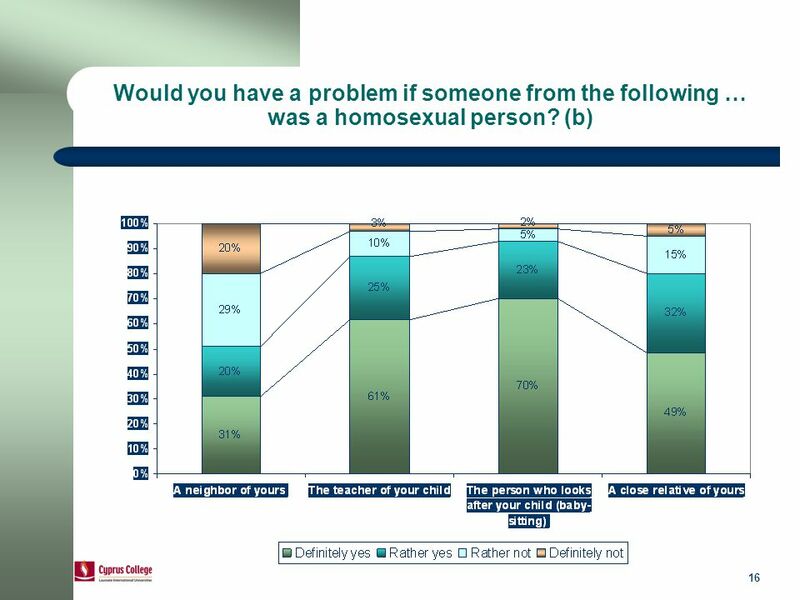 From here we can infer that as the respondents age increases, so as the probability increases for the people to have a problem if their child was acquainted with a homosexual. This probability is also associated with the low educational level of the respondents and their residence in rural areas. 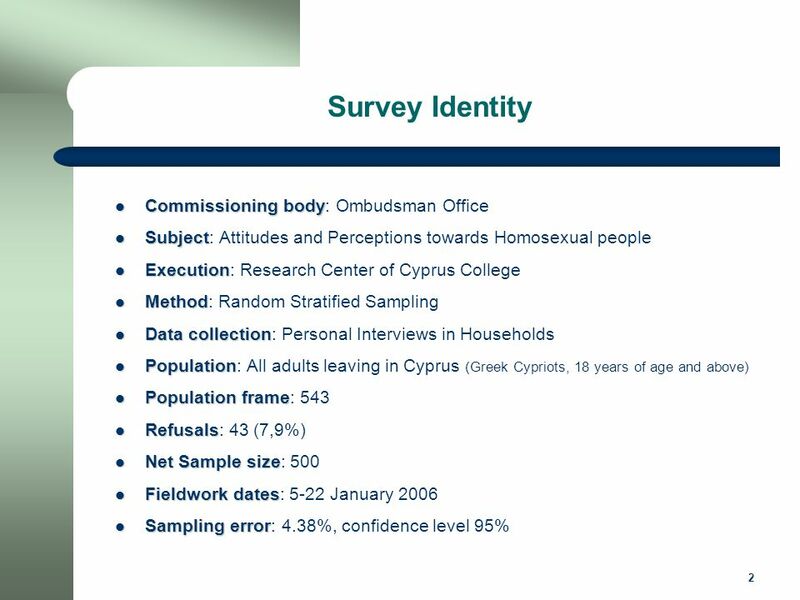 Regarding the districts of Cyprus more negative attitudes are perceived by the district of Paphos towards homosexuals. Regarding the interrelation with social classes, we observe that people who exercise manual work (C2 and D-E) appear to be more negative towards the possibility their child to get acquainted with a homosexual person. 29 29 Supposedly you’ve learned that your son is a homosexual, how would you react? 30 30 Supposedly you’ve learned that your daughter is a homosexual, how would you react? 31 31 It is really interesting to see the answers related with the reaction of the respondents if they’ve learned that their son or daughter was a homosexual. It is clearly shown that they would react almost the same in the possibility of their child (either son or daughter) being a homosexual. Almost seven out of ten respondents state that if they learned that their child is a homosexual (son or daughter) they would try to change the situation, while two out of ten state that in such a case it would bother them but they wouldn’t change their behavior. 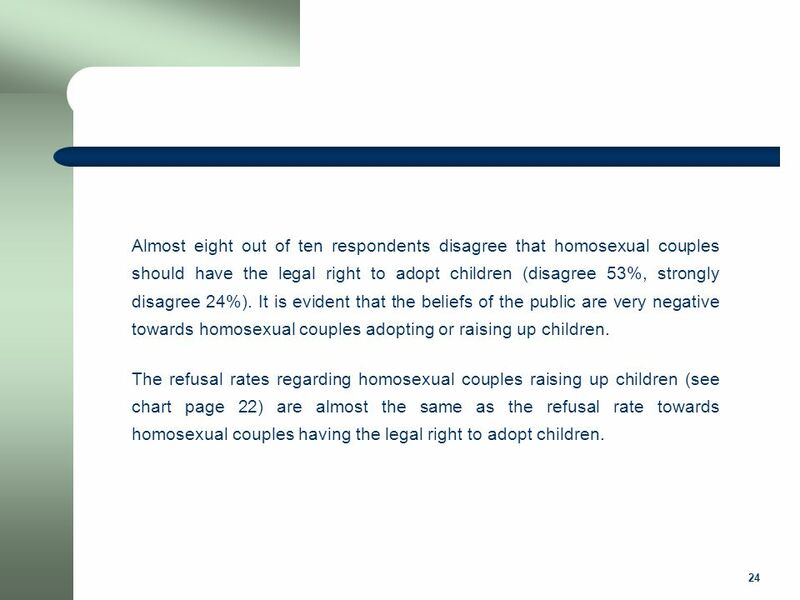 Only 3% of the respondents in both cases state that they wouldn’t be bothered if their child was a homosexual person. 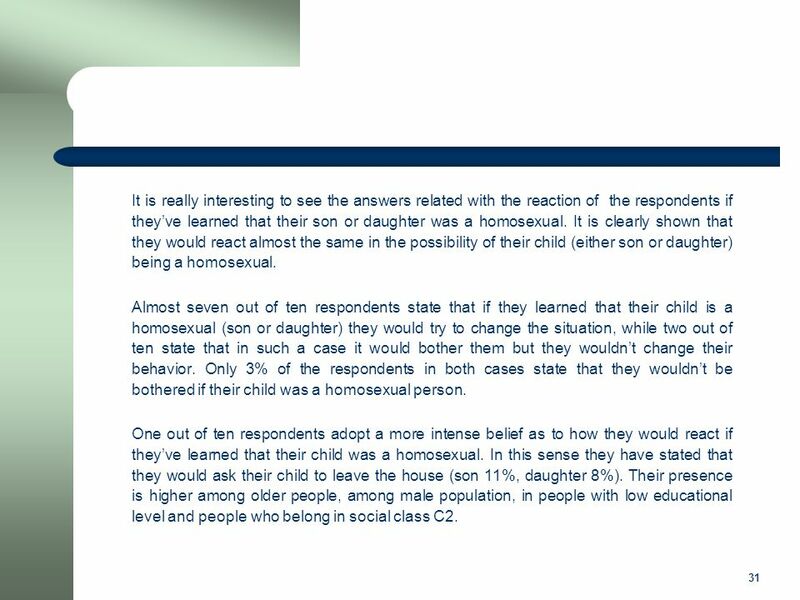 One out of ten respondents adopt a more intense belief as to how they would react if they’ve learned that their child was a homosexual. In this sense they have stated that they would ask their child to leave the house (son 11%, daughter 8%). Their presence is higher among older people, among male population, in people with low educational level and people who belong in social class C2. 36 36 The respondents who don’t perceive the sexual relationships of homosexuals to be wrong, differentiate their beliefs of coexistence with homosexual people in comparison with the general population. Generally they appear to be much less annoyed from the rest of the population regarding the cases at which someone (public person, doctor, colleague, friend etc) might be a homosexual. (cross tabulation of question 1 with 5). The previews observation applies for the category of people who mention that they feel comfortable being around with homosexual people. Contrary to the general population, the majority of these people wouldn’t be bothered if someone, under different social or interpersonal settings, was a homosexual. (cross tabulation of question 3 with 5). Download ppt "ATTITUDES AND PERCEPTIONS OF THE PUBLIC TOWARDS HOMOSEXUALITY A report prepared for the Office of the Commissioner for Administration (Ombudsman) By the."